Enjoy a spiffy new column we’re calling ‘Rooster Recap’, in which you can find brief synopsis/reviews of an ongoing show, hosted by one of the columnists here. 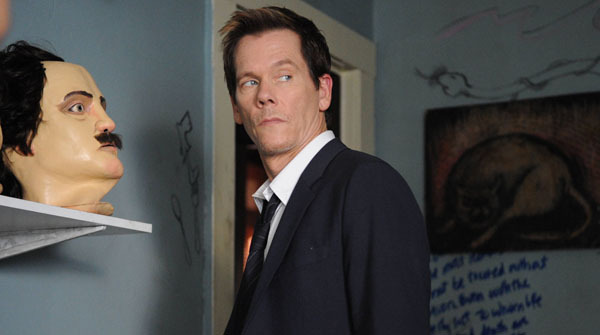 This time around, we’ll continue “The Following”, reviewed by Sarah from SciFridays. I don’t know if you guys have been watching “The Following”, but despite my tentative skepticism last week, I’m pretty hooked. It’s got this quietness to it, almost like it’s underwhelming. It totally got me into a state of false security. I, the queen of watching cheesy horror, jumped out of my socks in the scene immediately following the screengrab up there. At the risk of sounding like a paid advertisement, in all honesty, “The Following” introduces a lot of new-ness to the serial killer procedural. There are a lot of similarities, such as the presence of the latex masks also pictured, and a fixation on the creative works of horror creators (Hitchcock, Poe, Lovecraft, etc.) but there is an uncanny amount of detail written into “The Following” including the degree of ‘crazy’ writing done to the walls of the house (pictured above). Two thumbs up for the soundtrack so far, too, both the original score and the chosen pieces. The series opens with Marilyn Manson’s cover of the Eurythmics’ ‘Sweet Dreams‘, which does a really good job of echoing the sullen creepiness created in the show itself. This week featured the Massive Attack song ‘Angel‘ (‘Teardrop’ is the “House” theme) as covered by Sepultura, as well as ‘Change (In the House of Flies)‘ by the Deftones. Gee willikers, what do all these songs have in common? If you answered ‘soft growly vocals that slowly build over a lilting but minimal melodic track to a gravely climax of controlled gruff’, then you’d be right. I’m curious to see if my ‘music to plot’ theory pans out. *SPOILERS* This is the recap part. I think, as a collective audience, we are all waiting to find out who the next follower is. So far, we know his name is Rick and he has a love for the Edgar Allen Poe masks. Also fire. I don’t think I’m the only one who thinks Emma (babysitter) is a pretty neat character, but so far all of the followers feel sort of…empty. It was nice to see her past a little, but the mysteriousness they’ve built around the characters translate directly to my not connecting to them. As a show, they do such a good job of being accurate, but sometimes the cops/FBI do things and I find myself yelling at my laptop, “DUMB”. No one’s perfect, that’s for sure, but only one guard outside the bedroom when you know someone’s after her? I guess I can buy that there’s a non-blueprint hiding spot, but I still don’t understand why they don’t move the wife to a safe house. Jordan ‘Jordy’ is pretty good – I buy his bumbling aptitude. People can do things when motivated/trained, but ultimately he’s sloppy and rushed. The show down between them went as expected without any frills from the writing team. Well done.